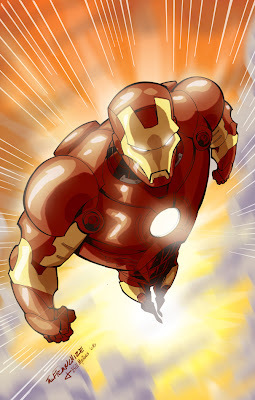 Peng-Peng Art: iron man day! first of all, let me say that i did not draw this. my husband did. and i thought he did such a flippin super job with it that i opted to use his depiction of Iron Man instead of an official movie image. next film - SPEED RACER!!! here's another couple of finished pencils of commissions i'm working on. these are both of Tammy, that lady i drew before who was sitting on a fence naked. he requested i draw two more but was so thoughtful that he let me forgo drawing the buckteeth if they were givin me problems. really made things a bit easier though i did try to subtly put it in there with the one she's laying down on. if i haven't said it before, hands and feet are so darned hard to draw. but i do think i'm doing a bit better on them. they're coming a weee bit more naturally now than before. even cloth isn't so daunting of a task to draw these days. gasp! could it be that i am getting better!?? !